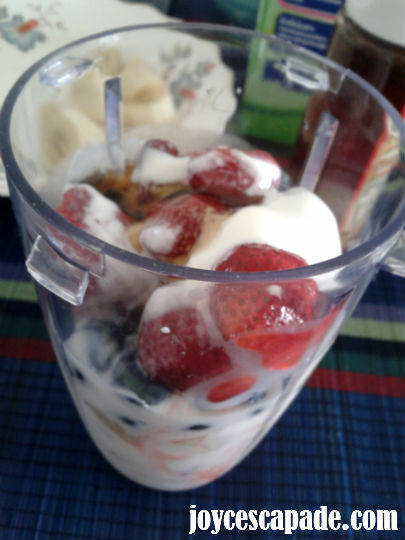 Two weeks ago, we made banana-strawberry smoothie with a smoothie maker. 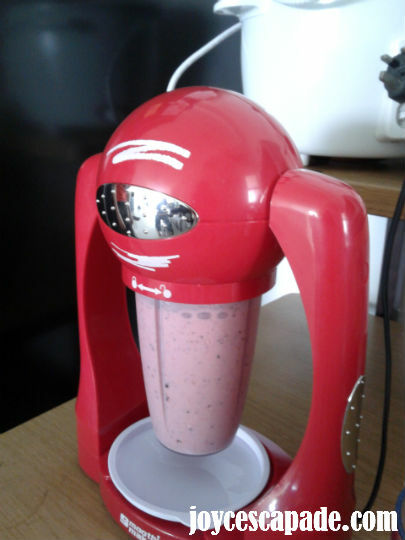 Last week, we made banana-strawberry-blueberry smoothie, also with our trusted smoothie maker. Choose a smoothie cup. 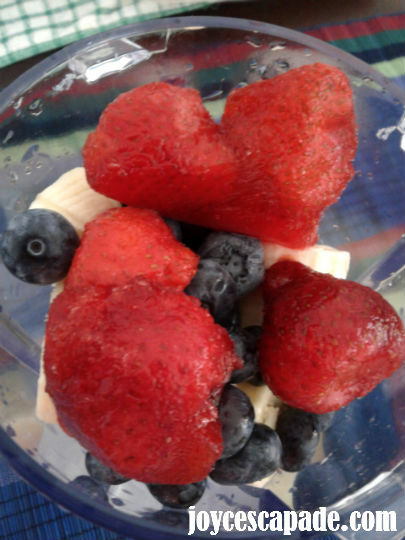 Put in a handful of ice cubes, followed by bananas, blueberries, and strawberries. 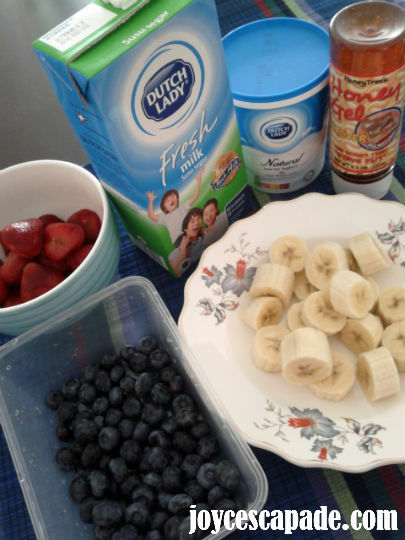 Don't forget to add a few tablespoons of yogurt, a cup of milk, and a drizzle of honey. Secure the cup to the smoothie maker and tighten it until your hear a "click" sound. Then, turn the cup upside-down to activate the motor. Note: If nothing happens after you turn the cup upside-down, return it to its original position and try tightening the cup again. This may take a few times until you're familiar with how much strength you need to secure the cup properly. After 20 seconds or so, stop the motor by turning the cup down. 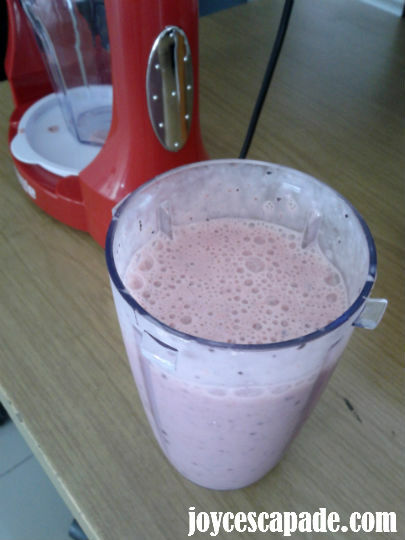 Then, unscrew the cup from the smoothie maker. Bump into your blog while I was looking for some delicious dessert...yours look pretty delicious and sweet to me. May I know where you get the smoothie maker? It looks pretty cool.. 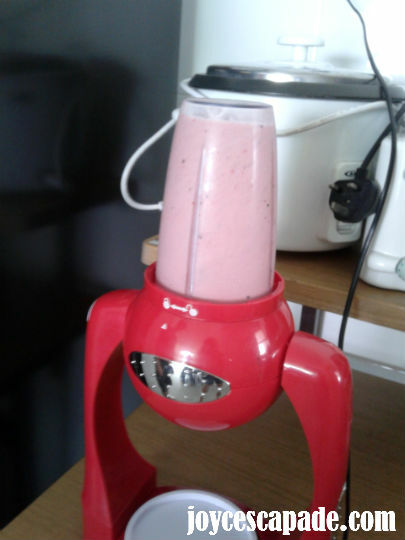 The smoothie maker can be bought from Groupon. But I'm not sure if the offer is still available. You can browse the Groupon website to find out. Hello. I was googling to find reviews on this smoothie maker and came across your site. What are your thoughts on the smoothie maker? Hi Jacqui, I find it quite hard to use, especially when I need to secure the cup to the machine. If you haven't secured the cup correctly or properly, the machine refuses to turn on.